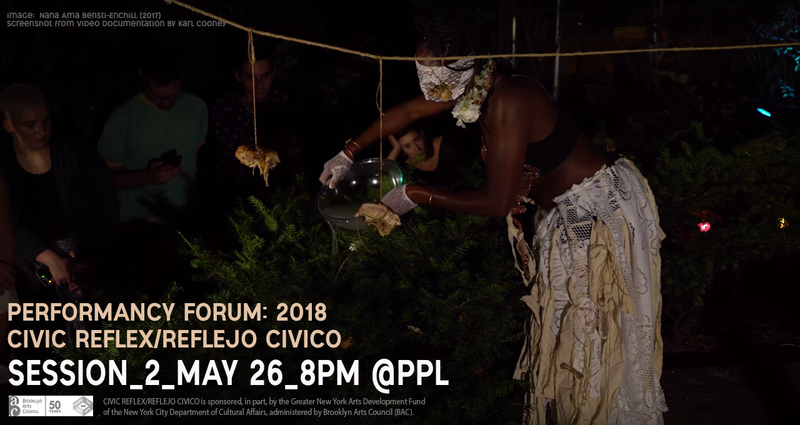 This event is SESSION #2 of PPL's 2018 PERFORMANCY FORUM program CIVIC REFLEX/REFLEJO CIVICO, a temporary collective of 20 artists/individuals/groups meet 5 times over the course of the year with public exhibitions of performance, dialogue, and discursive practice at 8pm on April 21, May 26, September 29, October 20, and November 10. CIVIC REFLEX/REFLEJO CIVICO participants are: Tsedaye Makonnen, Diane Dwyer, David Ian Bellows/Griess, Benjamin Lundberg Torres Sánchez, Daniel Gonzalez, Nana Ama Bentsi-Enchill, Aditi Natasha Kini and Amin Husain, Leopold Krist, Megan Livingston, Feminist Art Group (F.A.G. ), Amelia Marzec, Samantha CC, Sierra Ortega, Verónica Peña, Ada Pinkston, Lorene Bouboushian, Arantxa Araujo, Helen Yung, Rina Espiritu, and Pei-Ling Ho.